As of this writing, there are 96 customer comments and 13 answered questions for the Flash Furniture 31.5” Square Tempered Glass Metal Table. I've read the customer feedback and then condensed the results into this review. I hope this review helps you when you are shopping for the best outdoor table to add to your patio. The Flash Furniture 31.5” Square Tempered Glass Metal Table will enhance your bistro, cafe, restaurant, hotel, or home patio space. The ripple designed table top features a smooth surface for keeping items level. This outdoor table was designed for all-weather use, making it a great option for indoor and outdoor settings. For longevity, care should be taken to protect it from long periods of wet weather. 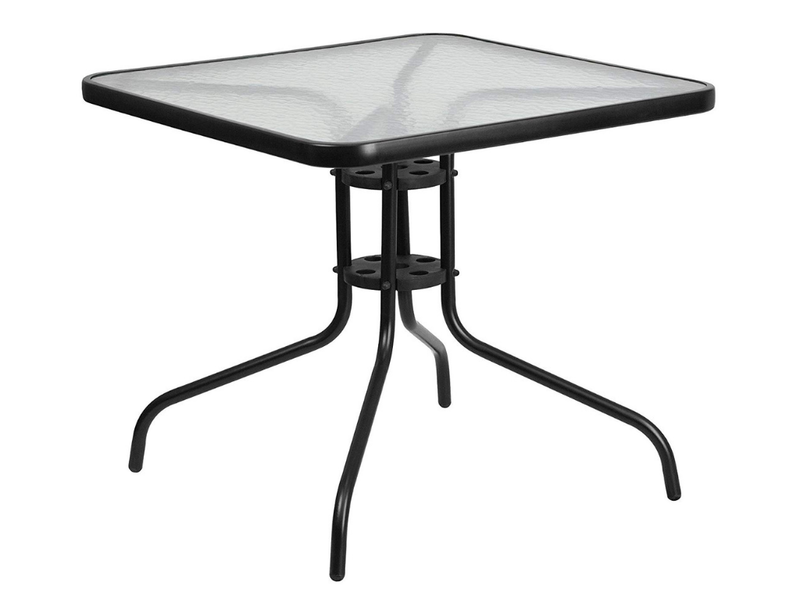 This outdoor table features a black powder coat finish and protective plastic floor glides. This is not a big table at just 31 1/2 inches square but if you are looking for a small table for a small space, you can't beat the price of Flash Furniture 31.5” Square Tempered Glass Metal Table. A customer shared, "I cannot say enough for this table. I’m totally delighted and it totally exceeded my expectations. I have been looking for a small table that I could use outdoors at my balcony. Prices were absurd and quality didn’t look just right for me and the high cost. Everything seems overpriced here in Boston. Until one day, visiting Amazon I found this one. I couldn’t believe my eyes it was only $30 and it seemed right. I read a few reviews and I decided to give it a try. My goodness, this is exactly what I was looking for. Perfect size for my small balcony. (I live in a second floor and space is limited) The square makes it ideal to have brunch on a beautiful day in autumn." This is a very easy outdoor table to put together. Not all of the tables that I reviewed were easy to assemble. According to the majority of customers who left reviews, it shouldn't take long at all to assemble it. A customer shared, "Assembling was extremely easy, everything comes in the package and you don’t need to have any tools. All included. Instructions are only one page with illustrations and super easy. I probably finished this in 15 minutes. Not heavy, except for the tempered glass." A lot of people who purchased The Flash Furniture 31.5” Square Tempered Glass Metal Table, bought it for a small balcony or patio. Many people have limited outdoor spaces but still want to enjoy the space that they have. This table should allow you to do that. With a dimension of 31.5 x 31.5 x 28 inches this table will not take up much space. A satisfied customer said, "This table is the perfect size for that apartment patio that can only accommodate a little more than a bistro set. The great part is that it's table height; wonderful for a nice meal place for two." There are a lot of comments left about tables arriving dented or scratched. Possibly the packaging could be improved. Here is one of those comments, "Decent table. Easy to put together but arrived with the paint finish on the legs totally scratched up. Very disappointed. Not able to recommend a product that isn't checked out before packaging." A customer explained how the alignment of the table he received was not right. This can throw off the whole table. The customer said, "I like the size of the table, but when it was made by the company they did a poor job of centering the insert on the table top. When I put legs in slot provided it wasn't centered correctly. I was able to use it but one of the legs are not perfectly level. I didn't report it and I'm sure they would have replaced it with a different one, but I didn't want to go through the hassle of returning it." There is no hole for an umbrella in this table, so be aware of that if you wish to put an umbrella through the table to use as shade. If you are wanting a table with an umbrella there are plenty of other outdoor tables out there with umbrella holes, some of which I have written reviews for. You could make a hole in this table if you have the capabilities to drill a whole through glass but it may be better to just purchase a table with an umbrella hole if that is what you are wanting. A customer commented, "I wish I had realized the table top does not have a hole for an umbrella. It's a nice little table for the price though. Will see how much it costs to have a local glass company drill a hole." Even though this is an outdoor table, the company recommends that you don't keep it in the wet weather for too long. A customer found out the hard way that it will rust and deteriorate if kept outside in wet weather. Perhaps this is not the best outdoor table if you received= a lot of moisture. A customer commented, "The table looks okay from the top, but the interior edges around the glass are rusting already and it hasn't even been outside two months. I would return it if I didn't have to take it apart to ship it." At just 28 pounds, The Flash Furniture 31.5” Square Tempered Glass Metal Table is easy for most people to move. It's not a featherweight table but it's also not super heavy. The majority of the weight comes from the glass section. Care will need to be taken so that you don't drop the glass, but other than that, this is a small enough table that doesn't weight that much, so it is easily movable. The Flash Furniture 31.5” Square Tempered Glass Metal Table has a height of 31.5 inches. This is normal for an end type outdoor table. Some felt that the image of the table was a little misleading, so just be aware that it comes to a height of just 31 1/2 inches. Most people who purchased this table and left comments about the table height were very pleased with it. A customer commented. "Nice table. Standard table height, not a bar or counter height as it may appear. Looks good." This is a sturdy table. You shouldn't have to worry about drinks spilling or any belongings falling off a wobbly table. One of the most important attributes of a table should be how sturdy it is. The Flash Furniture 31.5” Square Tempered Glass Metal Table scored well with customers for how sturdy it is. A customer commented, "Very sturdy. Have it sitting next to my spa to put drinks, MP3 player, cells phones, etc on. Great height for this purpose." The Flash Furniture 31.5” Square Tempered Glass Metal Table has a ripple designed table top that features a smooth surface for keeping items level. Designed for all-weather use, this table can be used both indoors and outdoors. However, for long periods of wet weather, it would be better to cover it or get it out of the moisture for prolonged life. Customers who left this table out in the rain were disappointed to find that it does rust quickly and easily. This table features a black powder coat finish with protective plastic floor glides. This is a very sturdy table. You shouldn't have to worry about anything falling off of it because of it being wobbly. It is not a large table, so the price is also not high. For what you will be getting, The Flash Furniture 31.5” Square Tempered Glass Metal Table is a good buy. Here are some top questions that I found for people considering buying the Flash Furniture 31.5'' Square Tempered Glass Metal Table. I hope that some of these questions may answer a question or two that you also had. Is the Flash Furniture 31.5'' Square Tempered Glass Metal Table foldable? It is not foldable but the legs come off so you can store the top of the table and the legs without taking up much room. Does this outdoor table come assembled? No, it does not come assembled. According to customers, it is very easy to assemble this outdoor table. Everything that you need comes in the package. Is there a hole for an umbrella? Unfortunately, there is no hole for an umbrella. Many of the customers who bought this table didn't know that there was no umbrella hole, so be aware that there isn't one.